My wishful thinking, creative energies, and Sylvanian voyages. I would love to simplify my life and live with less clutter in a pretty and cosy caravan like this. It would be a great vehicle to travel and see the world, and I would always have a companion in the trusty pony that pulls the caravan. This Sylvanian Dream Issue was released in 1989. The JP set includes a pink caravan and an adorable winged grey pony. 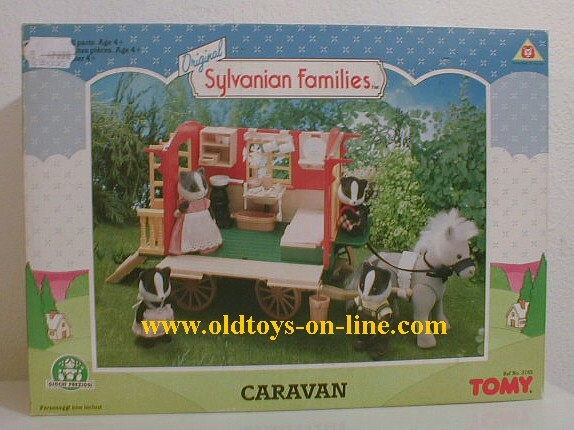 The caravan looks to be the same as the Original Sylvanian Families Caravan by Tomy, which was produced in the same year 1989, except for the color theme of the carriage and the nature of the pony. The Original Sylvanian Families Caravan is pulled by Bramble the grey pony. This winged pony pulls the pink caravan and takes off into the sky (as per the promo picture on the box of the set). Who wants to travel in an airplane when one can fly off in such a classy caravan. My winged pony is missing its original accessories so I have made my own. Most of the original accessories are shown in the photo, but I have taken the liberty to add other items to make the caravan look more lived-in. Below is some detail of the back of the caravan. I like that you can hang any number of things you might need for a particular adventure at the back....such as a pail, a kerosene lamp, a washing tub, a rope etc. There is also space to hang a bucket at the bottom side of the carriage (the original bucket that comes with the set is beside Miss Ivory Rabbit). Looks like our pony has discovered where its treats are stored in the caravan. Once you are inside the caravan, you can do a number of things: eat, sleep, wash up, and store your valuables. The little table lifts up and becomes a vanity, complete with mirror. So delightful! Hope you enjoyed the review. It was a little more detailed than usual, because I had so much fun playing with this set. I really enjoyed your wonderful photos of this beautiful and rare set!Loved all the little details and your setup! I also had a look at your updated collection photos. You have some great new additions! Sylvanako, thank you for your kind comments. I can't wait to see your next photos as well. Wow! That set looks amazing. Do you know where it is available? Possibly Ebay? I have been collecting Sylvanian Families for many years now and am always looking for great blogs and websites. I will be following yours now;you might like to visit mine at sylvanianvillage.weebly.com Your photography is out of this world! Keep up the fantastic posts. Hello Mia! Thank you. I got this set from Japan Yahoo, but it may possibly pop up on eBay. Must keep a keen eye though. I have visited your lovely blog-site. I especially love the Berry Brook noticeboard section. Such a cute idea. Hi Jennifer! Thanks again for your wonderful comments. Thanks Sigrun. This set was so much fun to play with. I have just chanced upon your beautiful Sylvanian blog. I neglected my collection for some time and my passion for it was recently rekindled. wondering where you got this carriage set from? so lovely! I like to experiment with photography and dabble in crafty things. I started collecting Sylvanian Families in 2009 and hope that someday my little daughter will enjoy playing and collecting Sylvanian Families as much as I do.